1 Июля 2017, Маттиас Лапп Маттиас Лапп занял должность Генерального директора U.I. Lapp GmbH. On 1st July 2017, Matthias Lapp took over the position of Chief Executive Officer of U.I. Lapp GmbH, and CEO for Latin America, Europe, the Middle East and Africa. After studying international business in Munich and Amsterdam and working for Coca-Cola in Mexico, he joined Lapp Holding AG in 2010. 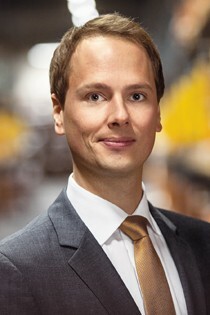 Within the Lapp Group, Matthias Lapp has done outstanding work in relaunching the Lapp Group’s corporate values. He became Head of Export in 2013 and, in October 2016, also took on the position of deputy CEO at U.I. Lapp GmbH. His contribution has brought many benefits to the Lapp Group, amongst them our first market activities in Panama and the formation of a local sales company there. “The LA EMEA region has grown significantly in recent years and I believe there is lots more potential there. I am delighted that, as CEO for LA EMEA, I will be able to work with you to develop it in the future, and thank you for putting your trust in me”, Matthias Lapp said.